In Arizona, choosing a concrete flooring can be a big decision. There are many factors that should go into your choice, and you need to be able to understand. Epoxy floors, Scottsdale stained epoxy concrete floors, and polished floors are among the most popular types of flooring that you should consider when deciding to utilize the concrete market. They all have their benefits, but knowing which one is best for your home or commercial business is essential to a long lasting concrete floor. The first and most appealing choice for garages, industrial, and commercial use, is the epoxy floor. This is one of the toughest and most durable finishes you can apply. It is resistant to heavy impacts, chemicals, spills, and abrasions. If applied in your home garage, you won’t have to worry about small damages that may occur when doing day to day activities. Scottsdale Epoxy floors 85255 also have the benefit of anti-dust technology. On standard concrete floors, normal foot traffic and day to day activities can kick up dust, while epoxy floors do not. Although we live in the desert and are not susceptible to moisture, epoxy floors are also moisture resistant. This is a great type of flooring in a garage and can also be useful in other, heavy duty areas where lots of traffic can occur. In addition to it being practical and useful, an North Scottsdale epoxy floors can also make your boring, ugly concrete floor look and feel great. This is by far the most popular choice for Scottsdale epoxy floor coatings. Another extremely popular option for concrete floors is the stained concrete floor. There are many benefits to this kind of coating, and all of them are great for industrial, commercial, or even residential use. The stained concrete floor is the most durable of surfaces. It is not easily damaged by heavy items, and it won’t be penetrated unless a jackhammer is used on it. Normal things that would damage wood floors, like moving around furniture, do not have the same effect on a stained concrete floor. It will not warp, flake, or chip like other concrete floor coatings might, and this makes it great for industrial and commercial use. In addition to being durable, it is exceptionally beautiful and easy to maintain. Stained concrete floors can be swept and mopped as needed, and they don’t even need to be cleaned on a regular basis. They are also reliably energy efficient and can moderate the temperature in your home. This means that in the winter, your home will stay warmer longer, and in the summer, it will stay cool as well. Not only is a stained concrete floor beautiful, energy efficient, and durable, but it is also water resistant, making it less susceptible to spills and other things that could damage other kinds of flooring. Another, less popular, kind of concrete floor is a polished concrete floor. This kind of floor has a more extensive and intense application process than the others. It’s a process of repeated sanding with different levels of grit to produce a shiny, reflective surface. A lot of industrial and commercial business owners like this kind of flooring because it negates the need for a different flooring overlay like wood or tile. The downside to this kind of flooring is that is is not as durable as its predecessors, and it must be cleaned with an industrial scrubbing machine on a frequent basis. This can be a hindrance if you run a commercial business because you will have to take time out of your day in order to have your floors cleaned, and it might deter business. It may look great, but the process to create and maintain it may not be worth the extra effort. As this floor does not have a protective coating on it, it is extremely vulnerable to chemicals and heavy duty machinery. That is why a Scottsdale epoxy coating 85260 or a stained concrete coating is best for both commercial and residential use. 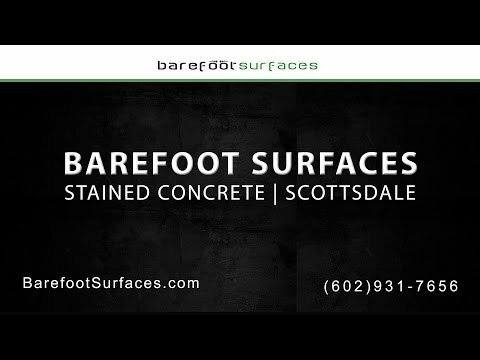 If you need help deciding which concrete floor coating is best for your home or business in Arizona, come to Barefoot Surfaces, where we can provide you with a veritable library of different floorings that are best suited for your commercial and residential needs, including outdoor epoxy floors in Scottsdale. Weigh all of your options and choose the right kind of floor for you, with Barefoot surfaces. For more information, contact us today!